Figure F2. Seismic refraction results. A. Map indicating shooting lines and ocean bottom hydrophones (OBH) overlain on bathymetry (m). B. NOBEL record section (part of Line 9). Mantle velocities (~8 km/s) are apparent at ranges of 1.62 km. 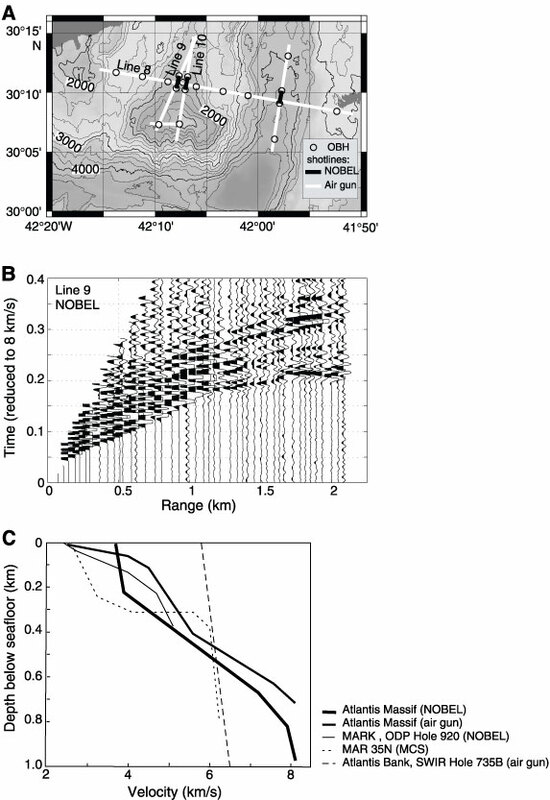 C. Comparison of subsurface velocity gradients at several seafloor sites. Atlantis Massif gradient is similar to that determined near Site 920, where serpentinized peridotite was recovered. The gradient near Hole 735B, where only gabbro has been recovered, is not as great. MARK = Kane Fracture Zone area, MAR = Mid-Atlantic Ridge, MCS = multichannel seismic, SWIR = Southwest Indian Ridge.